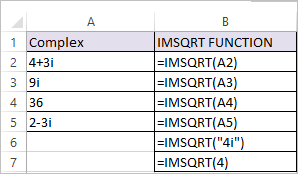 IMSQRT Function in Excel returns the square root of a complex number. Where inumber argument is a Complex Number that you want to find the square root of. In row number 6 IMSQRT Function takes up complex number(imaginary component) as a value which should be enclosed in double quotes. In row number 7 IMSQRT Function takes up real component as a value. supplied inumber argument is not recognized as a complex number.